TORONTO , Sept. 5, 2018 /CNW/ - Anaconda Mining Inc. ("Anaconda" or the "Company") (ANX.TO) (ANXGF) is pleased to announce another successful year for the Baie Verte regional swim program sponsored by Anaconda. 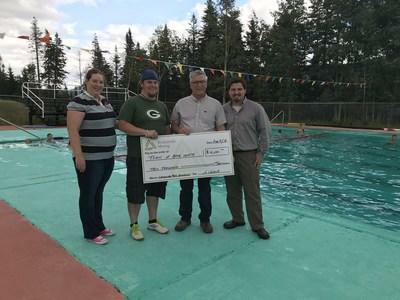 Anaconda representatives recently presented a cheque for $10,000 in the third of a five-year $50,000 financial commitment to the regional swim program. The commitment was prompted by the overwhelming success of an initiative started in 2015 to provide youth in the region with free swimming lessons. Prior to the 2015 summer season, average annual lesson enrolment at the Baie Verte regional pool was about 40 swimmers, however it now averages 150 participants each year. Approximately 600 lesson blocks (10 lessons per block) or approximately 6,000 free swimming lessons have been sponsored by Anaconda over the past four summers. "Most of our employees at the Point Rousse Project are from the Baie Verte region. The regional swim program sponsorship is one of the ways that they can share Anaconda's success with their families, friends and neighbours. As we expand our operations on the peninsula, we will continue to work in partnership with the Town of Baie Verte and surrounding communities to support activities and infrastructure that make the region a great place to work, live and raise a family."